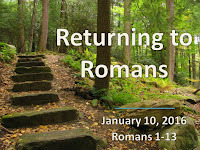 Today’s message is the second in a three part mini-series on this section of Romans that stretches from chapter 14 verse 1 to chapter 15, verse 13. And I know that’s been a couple of weeks since we looked at part one together, so we probably need some kind of a reminder. Remember that the church in Rome apparently had some tensions in it between the Christians. There were two main kinds of Christians there who were struggling in some ways with each other. What were the two kinds? Jewish Christians and Gentile Christians. Christians who were ethnically Jewish. They came from Jewish backgrounds. Paul was actually like that himself. And Christians who had no Jewish background. They were not ethnically Jewish and had never been. Which of these were more important than other? The Jews had a kind of priority because God had given them the law and the promises and the Savior first. But the Gentiles had a kind of priority because there were already a lot more of them. And the two groups were struggling with one another, probably over Jewishness and Gentileness. And we saw that Paul has explained his gospel in such a way as to bring “gospel glue” to bring together the Jewish and Gentile Christians at Rome. He has said over and over again that Jews and Gentiles are in the same gospel boat. Jews and Gentiles are both sinners. Jews and Gentiles are both justified by faith. God is using both Jews and Gentiles to save the other group? Jews and Gentiles while traveling somewhat different paths to get there are both in the same gospel boat. And Paul is showing that, in part, to bring them together in true Christian unity. Paul is applying the gospel to the question of Christian unity. What does it take to bring Christians together? How can Christians keep from being divided? What does it look like to strive for unity in the church? Why should we even do that? The gospel! Now, last time we met in Romans, we only took the first step in striving for unity, and it started in chapter 14, verse 1. Paul told the Christians in Rome that the first thing to do strive for unity was to keep from passing judgment on your brothers and sister in Christ over disputable matters. These chapters are a little complex to untangle, and it’s been two weeks, so bear with me. They are secondary items that genuine believers can have different opinions upon. They are not the gospel! Genuine believers cannot overlook differences in what we believe is the good news. But they are things that genuine believers can and will disagree upon and still have fellowship with one another. Last time, we used the example of the question “Can a follower of Jesus Christ watch a R-rated movie?” Do you remember that? That was another trick question, by the way. My guess is knowing our church family that there are multiple answers to that question right here in this room. And what Paul said in Romans 14 was that followers of Jesus Christ should be very careful to not judge each other on disputable matters. And that goes for both sides of all of these questions. For those who can and for those can’t. We are to be careful to not be judgmental and condemn or look down on our brothers and sisters who answer those questions differently than we would. And we applied that principle not just to movies but also to politics and to drinking alcohol and to setting apart holy days, and even to eating meat or only eating vegetables. Now, of course, that last one doesn’t concern us much these days, but it was the presenting problem for the church at Rome. It seems that the Jewish Christians were keeping from eating meat because it might not be kosher. They didn’t feel free to eat at Hog’s Galore. They didn’t have faith that it was right to just eat anything on the menu. Perhaps the meat had been sacrificed to idols. Their Jewishness while having some advantages was holding them back from freedom in this area. But the Gentile Christians probably didn’t struggle with that. They never had been kosher before, and they were well taught now that Christians can eat anything they can give thanks for. Paul himself even though he was a Jew ethnically had this same perspective on food. But, his main point so far was not to make sure that everyone shared his perspective but to NOT JUDGE those who didn’t share his perspective! Paul wanted the Christians at Rome to not pass judgment on their brothers over these disputable matters. They were supposed to form their own opinions and them out. Paul tells them to do only what they believed was right before the Lord because the Lord was going to judge us all some day. But because the Lord was going to judge us all, we could leave the judging to Him. Now, last time, we only made it up through verse 12. 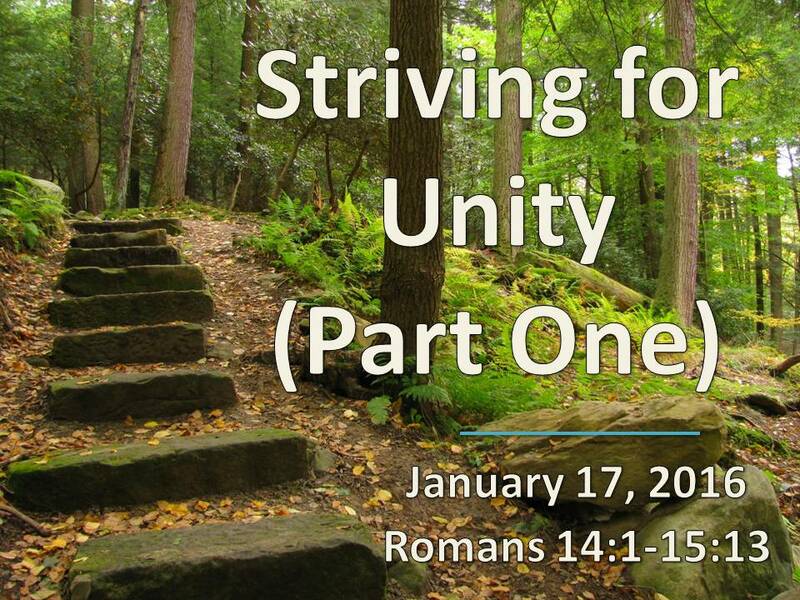 In verse 13, Paul takes this striving for unity one more big step. He says, it’s not enough to just NOT JUDGE your brother or sister in Christ on these disputable matters. We also must make up our minds not to TEMPT our brothers and sisters in Christ to betray their consciences on these disputable matters. DON’T TEMPT YOUR BROTHER TO BETRAY HIS CONSCIENCE. Now, what’s that? What is a stumbling block or obstacle? Well, there has been a lot of confusion on this concept over the years, but I think it’s relatively straightforward in this chapter. A stumbling block or obstacle is a temptation to fall into sin. It’s something that gets in the way of a Christian and entices them to fall off the Christian path. It’s not a minor inconvenience or an irritant, it’s a temptation to give in to what you believe is sin and therefore an enticement to get off of the path of discipleship. It’s this thing laid across your path that when you hit it, you go tumbling. Now, I said at dinner time last night that Paul was going to teach us today to not tempt our brothers and sister in Christ to sin. Well, we probably wouldn’t want to, but we might be doing it anyway if we insist on exercising our freedoms in these disputable matters all of the time. Let’s see how this might work. Remember, Paul is still talking about whether or not a Christian should eat meat or only vegetables. That’s really important right there. Paul knew that everything on the menu was okay. Jesus said so! But there were going to be Christians, many of them Jews, who didn’t get that yet and thought that it was wrong to eat at Hog’s Galore. But Paul says if your faith is weak on that question, then don’t you dare eat that meat! Now, here’s how we can get to tempting our brothers or sisters in Christ to betray their consciences. Well, for some of them, they will just turn away from you. And some will struggle with judging you back. But some of them will be tempted to eat that pork even though they believe that it’s wrong to. And what if they eat it thinking that it’s wrong? Then it is wrong for them right then. And they have sinned because they have betrayed their conscience. Is that a big deal? Yeah. If you do that enough, you will walk off of the Christian path and maybe walk off it for good. It is incredibly dangerous to go against your conscience, your God-given sense of right and wrong. And even if your conscience is a little off, it’s not good to go against it. Do you see how Paul has raised the stakes? Here’s how you put a stumbling block in front of your brother. You flaunt your freedoms in a way that makes them want to do something they think is sin. And it could lead to them being destroyed. So, think about your brother and sister in Christ. And be ready to lay aside your rights because you are thinking about their spiritual well-being. Does that make sense? Do you see how that is striving for unity? If you think about your brother and sister in Christ who are wrong about something but you are more worried about them obeying their conscience than about your being proved right, if you are more concerned for their spiritual well-being than your rights, then the church will be unified and strengthened and have peace. Of course, we are obsessed with “our rights” in this culture. So this is a hard-sell. Last time was easy because all I was selling was “Don’t judge your brother.” And while that’s hard enough to do, we all nod our heads at the idea. But Paul is saying something more. He’s saying that we should be ready to lay aside our rights for the spiritual well being our brothers and sisters in Christ. Because if we don’t, then we might be unintentionally throwing a great big rock into their paths. Don’t tempt your brother to betray his conscience by flaunting your freedoms. I can see at least four good reasons from verses 13 through 23 for us to think about today. #1. JESUS LOVES YOUR BROTHER. Jesus loves your brother in Christ enough to die on the Cross for him. Do you love him enough to not eat that bacon? The Lord knows I love bacon! But if I knew that I had a Jewish Christian brother on my hands who might be tempted to eat bacon that he believed was sinful, I would be happy to scrape that bacon into the trash. Amen? Because I doubt that I’ll have to do it. The one time I did, it worked out great. So we got to have Jimmy Deans with this Jewish Christian missionary! But forgoing bacon in that situation is easy for us. We don’t expect to have to do it. What rights might we have to give up to care spiritually for our weaker brothers and sisters in Christ? Those for whom Jesus loved enough to die? The kingdom of God is not about our rights. It’s not about our freedoms. It’s not about us at all! In just a few minutes, we’re going to go back that hallway, eat a delicious lunch and then have a congregational meeting. And I predict that we will enjoy wonderful unity. But that’s not how all congregational meetings are, is it? I was talking with a friend last week who said that when they grew up, their church had a congregational meeting every month, and it was fight every month. Christians disagreeing with one another and fighting over their preferences, their opinions, and lots of other secondary and relatively unimportant matters. It almost cost this person their faith. We know that the Kingdom of God is not about our rights. So we are willing to forgo our rights for the spiritual well being of our brothers and sisters in Christ. The flipside is also true. #3. GOD IS PLEASED WHEN YOU STRIVE FOR UNITY. Do you see how much God cares about unity? He loves it when we do whatever it takes in righteousness to lead to peace and mutual edification. He wants us to work at it. To strive for it. To make every effort. He wants us to build each other up. For the sake of food? #4. GOD IS AT WORK. Don’t tempt your brother to betray his conscience so that you can get your fill of meat! Don’t lead him to do something that he will regret later! Don’t tear down the work of God for your belly. I know that it’s a little hard to follow, but it’s really just looking out for your brother or sister in Christ. And not throwing something in their path that might take them down. Even something that’s okay for you, but it just isn’t yet for them. V.20 again. That “anything else” there in verse 21 means that this principle is widely applicable. This applies to food and also to drink. It also applies to politics and entertainment. Anywhere where you know that your actions, however clean in your own conscience, could lead another Christian you are in relationship with into betraying their conscience, this principle applies. Now, what does this mean in practical terms? I don’t think it means that you never do those things that tempt your brother. But you are mindful of them. You are careful with them. You live your life with a view, not just to doing whatever you feel like, but thinking about how your actions will affect others. For example, you might do those things if your conscience is clear, but you don’t broadcast them. I think that’s what he means in verse 22. I don’t think that means that you never talk about it. Paul is talking about it right here. But you don’t make a big deal out of those things which might be tempting to your weaker brother. You don’t flaunt it or brag about it or broadcast it or put it in their face all of the time. You are mindful of them. That’s what we teach kids to do right? My four kids have four younger cousins on my side of the family. And they know not to parade what they can do in front of their little cousins. One my kids got a video game for Christmas, and he was very careful not to show the violent parts to his little cousins. Not because it was bad for him to play those parts himself. He had a freedom in Jesus to do that, but because it would be bad for them. Do you see? This has some ramifications for social media, doesn’t it? Do you think about who your friends are on social media? And about what you post and how it might be received? Things you are free to do? Let’s say R-Rated Movies. Or drinking wine. Or tattoos or smoking cigars. But you know that those things might be a problem for some of your Christian friends. Not the ones who are judging you for doing it. I’m not worried about them. Don’t be held hostage by them. But what about the ones who might be tempted to go against their consciences and do something they think Christians shouldn’t because you are boasting about doing it yourself on your Facebook? If you have a clean conscience, I’m glad for you. Do whatever you are free to do to the glory of God! And you and I don’t want to be the cause of sin for our brothers and sister in Christ! Let me close by applying this to drinking. Paul went there in verse 17 and verse 21. For many many years I have been a weaker brother when it came to drinking alcohol. I thought I was a stronger brother because I kept from drinking. I thought it was morally wrong to drink. I was a teetotaler, and that was right and righteous! But over time, my conscience has been informed by a closer reading of the Bible to the point that I now believe that it is NOT sin to drink beverage alcohol. In fact, for many people, it’s a good thing. Jesus did it. In fact, Jesus made wine. He made the best wine ever. And He promised to drink it again in the kingdom. So that’s a change for me, at least in position. Not that I’m going to be drinking any alcohol any time soon. I have tried it and don’t like the stuff! But I believe that I could drink it, privately. However, I don’t believe that I could broadcast my drinking. You won’t see posts on Facebook about what a great time I had at the bar. Or a picture of an open bottle of wine that says that this is how I get through a hard day in the church office. And I wouldn’t invite someone to go with me to a bar or a wine-tasting event if I knew that they had a drinking problem or a conscience that said that drinking was sinful. One, that I have come to believe that it is a stronger believer who understands their freedom in this matter. And two, if you do not have that same freedom, then do not drink alcohol. Don’t go against your conscience! And don’t go against your conscience either, whatever it says. And we want to avoid sin like the plague! Let me sum up as we close and head off to our meal and meeting that will be full of righteousness, peace, and joy in the Holy Spirit. Here’s how we strive for unity. First, we refrain from judging each other on disputable matters. We’ll let God do the judging on those. And second, we refrain from flaunting our freedoms on those disputable matters in front of our brothers and sisters in Christ in any way that might tempt them to betray their own consciences and stumble into what would be sin for them. Because Jesus loved them enough to die for them. So we should love them, too. Because the Kingdom of God is not about our rights. Because God is pleased when we strive for unity. And because God is at work in our brothers and sisters and we don’t want to do anything that would get in His way. 1. Today’s sermon was Part Two. What did we learn in the first part? What are “disputable matters” (Romans 14:1) and how should believers relate to one another over them (Romans 14:1-13a)? What were the tensions between the Christians at Rome? How did the gospel provide “glue” to unify them? 2. If Part One was about not judging your brother in Christ, what was Part Two about (14:13b-23)? What did Paul mean by “stumbling block” or “obstacle? (14:.13b)” How can one Christian place a “stumbling block” in another Christian’s path (14:15, 14:20, 14:21)? Where have you seen this in life? 3. What are the 4 reasons Pastor Matt gave for why not to put a stumbling block in front of another Christian? Which ones spoke to you personally and why? What are things you do (or don’t do) to keep from causing fellow Christians to stumble? 4. Are there things that you believe would be sin for you to do that might not be sin for someone else (14:14)? What things and why? 5. What is the conscience? Why is it important to not go against our consciences? 6. What questions did this message raise for you that you need to do more thinking and praying about? What changes do you think the Lord wants you to make in your life? This past year was one of the most difficult I’ve ever experienced in my life, and I’m grateful to our Lord for not only getting me through 2015, but also giving me such a wonderful church family to travel together with through it all. This last summer, I had two hospitalizations and my first major surgery. I would have never chosen these health troubles, but the Lord has used them in my life in ways for which I’m very thankful. During my time in and out of doctors’ offices, I learned many spiritual lessons in the “School of Affliction”(Psalm 119:71). I’m also grateful to have come through my illness so healthy and strong. - An amazing set of nurses and aides on the third floor at Dubois Hospital. They have a difficult job, and they do it with panache. These and so much more are my Lord's mercies which are served up fresh and hot each day. I'm really excited about getting back into full time active ministry: preaching the word, equipping the saints, shepherding the flock, and making disciples of Jesus Christ. I know that each day I get is a gift, and I resolve to use them for what really counts–His Kingdom and His righteousness. I want to repeat all of that again. Thank you, dear church family, for your support and care for me through my illness and recovery. I’m thankful for the Elders who told me to stay out of the pulpit even after I had been released to go back to work. They arranged excellent guest preachers and make sure all of the bases of ministry were covered. I’m thankful to Marilynn Kristofits in the church office for her “administry” of so many details while I was out of commission. Our church didn’t miss a beat, and I am incredibly proud of all of you and feel blessed to be your pastor. But just when I was starting to feel better, a true tragedy struck our church. Blair Murray died in an airplane crash on October 12th. At Blair’s memorial service, I preached from Mark 10 and said that Blair showed us how to be truly great. Blair was a great man because he loved and served others and because he loved our Lord Jesus more than everything else. Now that he’s passed, I’ve been very encouraged to see how many people have “stepped up their game,” of praying, serving, loving, and caring because of Blair’s example. So, when I wrote in last year’s pastoral report that I saw 2015 being a “life-changing” year, I truly had no idea what that would actually mean! It seems like an understatement now. But much more happened in 2015 than those two big difficult things. We had many sweet blessings to celebrate, not just bittersweet ones. Read the reports from our ministries in the rest of this document to get a taste of what else God has been doing in our midst. We celebrated five baptisms of young people on Resurrection Sunday. Tyler Matthews, Thomas Kovalick, Megan Kerlin, Joshua Kerlin, and Nathan Kerlin all proclaimed that the Lord Jesus has changed their lives forever. We reached out to our community through large group events like the Last Supper Drama, “God’s Not Dead” Movie Night, Family Bible Week, and the Good News Cruise. We hired two young men as Summer Ministry Interns and gave them valuable learning experiences. Hunter Galley and Drew Moore spent the summer growing spiritually as disciples of Jesus Christ, learning how church ministry functions, and serving our youth and children’s ministries. Our interns also joined our team of 9 intrepid members who traveled to the Pittsburgh Area to partner with two other district churches for a week of shared ministry. Our Pittsburgh Ministry Team, led by Curt and Steph Quick, worked with Pastors Alex Ielase and Kerry Doyal to share the good news of Jesus in public parks and a “mini-Family Bible Week.” I was proud of them stepping out of their comfort zones to reach people for Christ. On average, our attendance at worship was lower than previous years, probably due in part to a severely cold winter, but we averaged a solid 143 worshipers each Sunday (last year was 145). 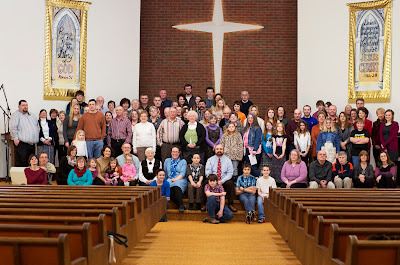 The highest attended service was Resurrection Sunday with 252 people present. I believe we are actually growing numerically when you count how many people take part on a regular basis. We also took on new members: Renée Mostyn, Bonnie Dobash, and Darla Kyler. We had a faithful group of folks pray each month at our Harvest Prayer Time. Every time I turn around, I see something new that the Lord is doing. My plan was to finish the book of Romans by September, but life interrupted. I did preach Romans chapters 6 through 13 before I took sick, but then Romans went on the shelf for the rest of the calendar year. While we were in Romans, we learned many wonderful things about the gospel and memorized several key verses together–Romans 6:23, Romans 8:1, Romans 10:9, and Romans 12:1. We returned to it this month, and I hope to see it through to the end by spring. Our Advent season this year focused on John 16:33, “I have told you these things, so that in me you may have peace. In this world you will have trouble. But take heart! I have overcome the world.” We learned that we are living in a war zone, but the outcome of the war has been decided from the beginning (Genesis 3:15). And because Jesus’ future victory is sure, we can have peace right now. I also spoke to the West Branch FCA Bible Club several times, to the moms at our MOPS group and the Penns Valley MOPS group, to seniors at a Lenten Luncheon, to a Ministerium Lenten Service, to the residents at Windy Hill Village, to the men’s ministry of McKeesport’s First Free Church, and the fathers and sons at the retreat at Miracle Mountain Ranch. Because of my hospitalizations, I was out of the pulpit more this year than I have ever been since becoming your pastor, but our guest preachers served us well. It was great to know that trustworthy guys like Mark Brenner, Donnie Rosie, and Dan Stanley from Miracle Mountain Ranch were pinch-hitting for me. Tim McGill really came through for us this year, preaching several times and on short notice when I was sick. And I was so thankful that my pastor, Jeff Powell, could be present on the Sunday after Blair died to comfort us and keep us focused on Jesus Christ. One of my favorite moments in ministry this year was during the Good News Cruise. While I hobbled up and down the rows of cars talking to our guests, I was struck by how many of our people were serving others for the sake of the gospel, and how little I had to do with it! One way to measure effective pastoral ministry is recognize how many people are truly equipped for ministry. A church that can do major things without needing their pastor to do much is a healthy church! This year, I completed an “elder training course” with our first cohort. I hope for many more cohorts in the years to come. I also met throughout the year with all of our ministry leaders for equipping, training, and mutual ministry. In addition to coaching our local church leaders, I remain heavily involved in the broader EFCA on both the Allegheny District and national levels. In 2015, I continued to serve on the district board, chair the Constitutions and Credentials Board, coordinate the Stay Sharp theology conference, and attend a regional pastors’ group. On the national level, I continued to serve as the book review coordinator for “EFCA Now” for whom I also wrote an article on the occasion of his retirement about what I’ve learned over the years from EFCA President Bill Hamel. I also continued to serve as a member of the Spiritual Heritage Committee (SHC). I was able to attend the EFCA Theology Conference last January and, with Heather, attend EFCA One where we approved the new president of our association, Kevin Kompelien. In 2015, Nesta Kephart and I were interviewed by EFCA Today on the topic of community-shaped disciplemaking. I love that our church partners with other gospel-centered churches who are similarly focused on growing followers of Jesus Christ! 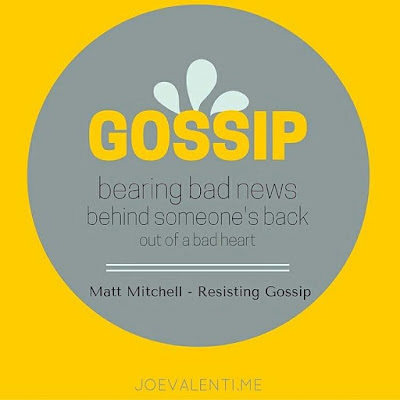 Resisting Gossip continues to expand my equipping ministry beyond our community, as well. In 2015, the French version was published in both France and Canada. In September, I got to travel to Montreal for the official launch of Résister à la Médisance. I also got to speak at CCEF’s national conference on this topic. Thank you for allowing me to serve the body of Christ beyond our region. It is a privilege. One of the most important things I do in ministry is to simply spend time with people. I love being in your lives, whether in pleasant circumstances or difficult ones. Throughout the year, I have visited in most of your homes, and also visited folks in hospitals, prisons, and funeral homes. In addition to Blair’s funeral, I also officiated at funerals for Adam Slabon, Arnold “Sonny” Collar, Russell Martell, and Jimmy Netterblade. It is not “flashy” ministry, but is a true privilege to shepherd you through the good and the bad times. And as I said earlier, this year, I felt shepherded by you. Thank you for visiting and praying for me during my hospital stay! In the first Sunday of this year, I preached a message entitled, “Sent on a Mission in 2016.” In that sermon, we went back to the Great Commission to remind ourselves what we are all about as a church. Even though it’s a new year, nothing has really changed. Our message and our mission stay the same. Our message is the Gospel of Jesus Christ. And our mission is to make disciples of Jesus Christ to the glory of God. Whether we are reaching out to our community through a big event such as our Wild Game Dinner, Family Bible Week, or Good News Cruise, sending folks on a mission trip, such as John Forcey and Roper Houston headed back to Oaxaca, Mexico in February, packing our teens off to the EFCA’s Challenge Conference in Louisville for discipleship training and learning to “Live Sent,” or simply continuing our many week-to-week ministries in a faithful way, everything we do in 2016 needs to make sure that our gospel message and disciplemaking mission is kept central. This year may be easier than 2015 or it may be the same or even harder than last year, but our Lord Jesus promises to be with us every step of the way (Matthew 28:18-20). So, let’s take heart and stay on mission. I tried to preach this passage once before, and it didn’t go so well. I was studying Romans 14 and 15 on a Saturday back in July and trying to write a message entitled, “Unity,” but my gut kept hurting. And I ran into Myra at the Post Office and I told her that my gut was hurting again, and she encouraged me to go to the emergency room. So I did, but I took my commentaries with me still intending to preach Romans 14 and 15 the next day if they didn’t admit me into the hospital. But they did admit me into the hospital, and I have never gotten back to chapter 14 until today. So you could say that I’ve had 6 months to prepare this message, and it better be good! This week, I told Marilynn that I was planning to preach chapter 14 verse 1 through chapter 15 verse 13. Because that’s the next big section, and it all fits together. And it’s all about one thing, striving for unity in the church. But I realized as I was preparing to preach that I had bitten off more text than I could chew. More text than I could preach very well in one sermon. Of course, last week I preached 13 chapters in one sermon, but that was a review. This is new territory for us together. 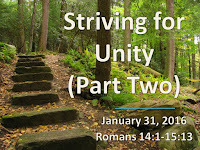 So, I decided to change my strategy a little and title this message, “Striving for Unity (Part One).” So we’ll spend more than one week working our way through this section. Today, we’re just going to go through the first 12 verses. Let’s do everything we can to strive for unity among Christians. That’s what we’re going to talk about for the next few weeks in the book of Romans. What does it take to bring Christians together? How can Christians keep from being divided? What does it look like to strive for unity in the church? Why should we even do that? And what sometimes gets in the way? In some ways, this is where the whole book of Romans has been headed all along. I don’t know about you, but I tend to read Romans like it’s headed for chapter 8 and then end there. And sometimes I also skip over chapters 9 through 11, that Israel stuff, and then camp on Romans 12 and maybe 13. But then I feel like the book is over, time for all of the signing-off at the end in chapter 16; I don’t really know what to do with chapters 14 and 15. But Paul didn’t skip those chapters. He wrote them there! In many ways, he was driving towards them the whole time. All of the Christians in Rome. And there were, apparently, two major groups of Christians in Rome. Who were they? The Jewish Christians and the Gentile Christians. And there were apparently some tensions between those two groups. But there were probably many many more Gentile Christians so they had the priority of numbers. Romans 9, 10, and 11 are in the book because it looked even then like the promises to Israel were not being fulfilled. And the two groups were struggling with one another. There were tensions between the two kinds of Christians. And into that tension, Paul writes this letter about the gospel. And one of the big reasons why he writes it is to address that conflict and to bring the two groups together in unity. So all of that gospel stuff in the first eight chapters isn’t just theology. It’s glue. Gospel glue that brings Christians together and makes them one. That’s why Paul keeps stressing that Jews and Gentiles are all in the same boat. Which ones are sinners? Gentiles or Jews? Both right? Which ones are justified by faith? Gentiles or Jews? Both right? Which ones are God using to save the other group? Gentiles or Jews? Both right? That’s right. Jews and Gentiles while traveling somewhat different paths to get there are both in the same gospel boat. Paul stresses that again and again and again. And here’s why. At least one of the reasons why. Because he wants to bring them together in Rome so that they strive for Christian unity. A proper Christian unity. Paul is still applying the gospel. Ever since chapter 12 began, he has been relentlessly applying the implications of the gospel to the every day life of the church. And now he addresses unity in the church. And calls for believers to strive for that unity, to make every effort to do what leads to peace and mutual edification. And the first thing he says that we need to do is to stop passing judgment on our brothers and sisters in Christ. #1. DON’T PASS JUDGMENT ON YOUR BROTHER. Now, this may come as a shock to some of you, but it is actually a fact that Christians do not always agree with one another. Did you know that followers of Jesus do not always see things in the same way? In fact, you probably don’t have to be a Christian for long before you meet another Christian who sees something differently than you do. And sometimes those differences can be very strong. And they can divide Christians and keep them from living and ministering in unity. Now, there are some matters which should be indisputable. There are some things that are right and wrong and there should not be two opinions on it between Christians. For example, all Christians should believe in the full deity of Jesus Christ. If you don’t believe that Jesus is the son of God and God the Son, then you are not a real Christian and other Christians can’t have unity with you. Indisputable. Or another example, fitting for today, all Christians should believe that infanticide, the killing of babies is evil and wrong. I think that’s indisputable. But there are many things that are much more debatable. That genuine Christians can have differing opinions on and still get along. These are things that genuine Christians can and will disagree about. For example, can a follower of Jesus Christ go to the movies? Now, I think that most of you would answer yes to that question, but I’m not sure if all of you would. I am sure that many of you remember a time when church leaders you knew taught that it was wrong for believers to go the movie theater. I think that’s an example of these kind of disputable matters. Doesn’t mean that it’s not important. It just means that genuine Christians can disagree and can still function in Christian unity when they disagree. We don’t have to judge each other. We don’t have to pass judgment or condemn one another when we answer these kinds of questions differently than another Christian might answer these same questions. Now, you might not like my example. For you, this might be a matter that would lead to dividing. You can’t live in unity with a believer who differs with you on the question of R-rated movies. Either for or against. One of the difficulties in applying Romans 14 and 15 is that these matters often matter so much to us that it’s hard to decide sometimes if the specific issue fits into the category of disputable matters or not. And there are a lot of issues to work on. One author that I respect a lot has listed 75 common issues that Christians often debate like this. And he’s got them broken up into like 17 common categories. I’m not saying it’s easy. But Paul is saying that’s possible. And that it’s important whenever we can to not pass judgment on your brother and sister in Christ when the matter is secondary and debatable. Now, Paul doesn’t come out and say here in chapter 14 that the two groups that are struggling with one another are the Jews and the Gentiles. Instead, he uses the words “weak” and “strong.” “Weak in faith.” V.1 again. Now, Paul never says exactly who that is whose faith is weak, but I think from the context that he’s mainly talking about Jewish Christians. Now, I think that means Jewish Christians who haven’t really got used to the idea that they can eat anything on the menu. Or even this beef, right here. Was this butchered in a kosher way? Has it maybe even been offered to an idol before it came to my plate? That was the problem in 1 Corinthians 8 which is very similar to this passage. The Gentile Christians, by and large, didn’t care about that. They understood their freedoms better. So they had faith to eat anything. But these weak guys only had faith for vegetables. Those were what was safe. Now, what does Paul say to do with the weak Christians? Beef ‘em up, right? Literally! Oh, so it works both ways! The strong is not to pass judgment on the weaker brother. And the weaker brother is not to pass judgment on the stronger one, either. Both kinds of Christians are called to love and accept and receive and welcome one another without condemning each other. Now, that’s easy for us when it comes to meat and vegetables, I think. We don’t have this disputable matter at hand, but what if it’s something else? Or whatever. Paul will mention alcohol in verse 21. But the point that Paul is making is that we are to do our best to not pass judgment on our brothers and sisters in Christ. When we condemn someone else for something the Lord does not condemn, then we are acting like we are their Lord. I am not your Lord. And you are not my Lord. So we don’t need to be judging each other. Amen? Because, of course, we have to make some judgments. We have to be discerning. Not everything is right. On some things, we can’t both be right. Remember, this is not gospel stuff. When people start to get the gospel wrong, Paul goes ballistic. Read Galatians some time. There is plenty of judgment stuff there. Read Romans 1, 2, and 3! This is only on disputable matters that we can give each other this grace. But regardless, we are not each other judges. I said last week that I wouldn’t talk about the election much this year, but I will tell you this story. Years ago, Heather and I were visiting some Christian friends of ours who were of a different political persuasion than we are. I won’t say what we are or what they were because I don’t think that’s helpful most of the time for a pastor to talk about politics in public. But when we pulled up to their house to visit, they had a political sign in their front yard for a presidential candidate that I couldn’t vote for. But they had their reasons why they were for that candidate. And they had Christian reasons for it. And at one point, we had to have a talk about it. And we had sweet fellowship with one another and still do today. We talk about politics. We try to convince each other of our opinions. And I’m still right, and he’s still wrong! I still think he’s talking in general about Jewish Christians and Gentile Christians. The Jewish Christians would have their Old Testament holidays that they would want to celebrate. And they would have a day each week that was ingrained in them to set apart as holy. What day was that? The Sabbath. But the Gentile Christians wouldn’t see it the same way, would they? They would have thought that the Jewish Feasts were interesting but not sacred. And even the Sabbath pointed to Jesus as the true Sabbath and the kingdom is the Sabbath rest to come. So, you don’t have to have a whole sacred day every week. Not for New Covenant Christians. Yes, you need to regularly gather with God’s people and worship. That’s indisputable. But is Sunday the new holy day? Let me ask you? Is Sunday the new Sabbath? I’ll bet some of you say yes and some of you say no. What does Paul say? V.5 again. #2. DO WHAT YOU TRULY BELIEVE IS RIGHT. Do what you truly believe is right before the Lord. You see, these are important things to think about and important things to make decisions about. Just because they are disputable doesn’t mean they aren’t important. Christians should carefully think through what they believe and what they think they ought to do and ought not to do. Should a Christian watch an R-rated movie? And if you are convinced that Christians can and sometimes should watch a movie like that, what are the biblical principles that guide your decisions about which ones to watch and when to watch them? Or on the other side, why not? What are the biblical principles that guide your decision-making on that issue? Here’s one on the special days question. Do you think that Christians should celebrate Christmas? I would guess that most of you would. I would guess that all of you do in some way. But think about this, the Bible never commands Christians to celebrate Christmas. Or Easter for that matter. We worship on Sundays because the Lord was raised on a Sunday, but there is no command to once a year celebrate His resurrection. That’s a just a tradition. It’s not a bad one. We do it. Does it make you an unbeliever? Does it mean that we shouldn’t welcome you as a true Christian? And the church ought to embrace both kinds with warm love. Both kinds of Christians should do what they truly believe is right before the Lord. You and I are to do what we truly believe that the Lord wants us to do. If you truly believe that the Lord wants to you watch that movie, then please do. If you truly believe that the Lord wants you to take that drink, then please do. If you truly believe that your Lord wants you to set aside a day as holy, then please do. Same the other way though! If you truly believe that the Lord does NOT want you to watch that movie, then please don’t! If you truly believe that the Lord does not want you to take that drink, then please don’t! If you truly believe that the Lord wants you to treat every day the same, then please don’t make one holy! I did two funerals this week. One for a ten year old boy. I don’t know how I could live without believing that Christ died and returned to life so that He might be the Lord of both the dead and the living. And because I believe that, I want to honor Him with all of my life. All of my decisions. Everything I do and don’t do should be for His glory. And so should it be for all of my brothers and sisters in Christ. Even if what they choose to do is different than what I would do. Jesus is their judge. Not me. The Lord has that handled! To realize that we will all have to give an account for what we did with our lives? We should be more concerned with what we are doing with our own lives than what other people are doing with theirs. That doesn’t mean that we won’t care. It doesn’t mean that we won’t try to help people that we think are doing something wrong. Genuine love does that, too. If you think that I’m doing something wrong, I invite you to try show me that in love and persuade me to your way of thinking on these disputable matters. But let’s leave the judging up to God. I think He knows what He’s doing. There is much more to be said about how to strive for unity, but this is the first thing. Don’t pass judgment on your brother and sister in Christ on these disputable matters. Form your own opinion and live it out. Do what you truly believe is right before the Lord, remembering that we will all be judged some day soon. We will all have to give account. So, let’s warmly accept and receive and welcome and love each other while we wait for that day when every knee will bow and every tongue confess that Jesus Christ is Lord. Thanks, Joe, for creating these posters! Thanks, Joe, for creating these posters! You are a Barnabas. We said in the Fall of 2014 that in the Bible all roads lead to Romans, and now our road as a church has returned to Romans once again. Anybody want to guess what the date was when we left off our study of Romans? 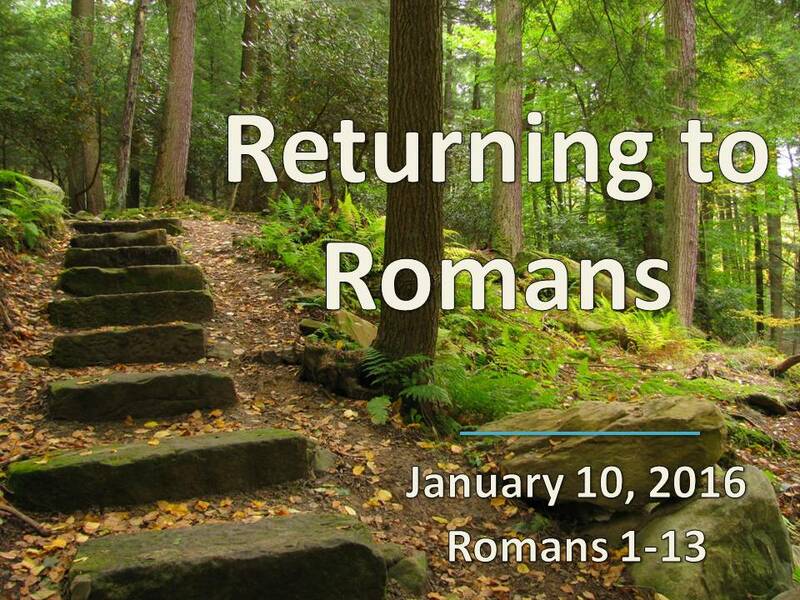 The last sermon I preached on Romans was June 28, 2015. So it has been more than half a year since we were Romans together. A lot has happened since then, hasn’t it? Not the least of which for me was that “vacation” I took this Summer when I checked myself into that posh resort in Dubois where they help you lose weight the easy way. They just cut it right out of you! I said when we started this series that I didn’t want to be one of those preachers who go into Romans and then never come out again. Some preachers stay in Romans for 8 or 10 years preaching on it every week verse by verse by verse. Well, we came out of Romans all right, and we stayed out Romans for half a year. But now we’re returning to it again. And we probably need to do some kind of a review. I’ve struggled to figure out how to return to Romans. I mean it’s been half a year, I’m sure that we don’t remember all that we’ve learned. In fact, I had a funny experience this week. I read through all 31 sermons that I had preached on Romans in 2014 and 2015. And the funny thing was that I kept learning things! I kept saying, “Oh yeah, that’s a good point.” From my own sermons! I think he was mostly joking, but that’s pretty much how I felt this week when I re-read those 31 sermons. There are so many glorious things to learn in the book of Romans, and we’ve probably forgotten more already than we learned together in those 31 sermons. We’ve completed the first 13 chapters. 13 of 16. We’re almost there! But it’s been half a year. So how do you review? I thought about just trying to read those 13 chapters to you. But I know that it would take more time than we have this morning. And we want to get the Lord’s Table this week! We didn’t get there last week, but we’re going to get there this week! I promise. So, we’ll have to summarize. But how do you do that? When I was a writing this sermon, I would come home and tell the family how many points I had summarized these chapters into. So, today I have boiled it down 5 points of summary to review. And I’ve worded them all as things to remember about ourselves that change how we live each day. But I’m not saying that they do justice to the book in any real way. There is just too much here to think that we can capture it all in a few words. And I’ll probably try to sneak in some more as we go! Here’s number one. I hope it sounds really familiar. #1. I AM NOT ASHAMED OF THE GOSPEL. The book of Romans is about the gospel. The good news. It’s about the “main thing,” like we talked about last week. The book of Romans is a letter. It’s a letter from the Apostle Paul to all of the Christians in the city of Rome. And it’s a letter about the gospel of Jesus Christ. Let’s read the first 7 verses to remember how Paul sets the stage. I don’t want us to forget that Romans is a letter. Remember that phrase, “I am loved by God!”? I’m sneaking this in! Remember we talked about putting that phrase on a notecard on your mirror and reminding yourself of it every day? We learn just how much that is true in the book of Romans. But the other key word in the verse is ALL. A-L-L. The letter was written to all of the Christians at Rome, not just the Jews or not just the Gentiles. There was, apparently, tension between the Jewish Christians and the Gentile Christians at Rome. Remember that? And Paul sets out his presentation of the gospel not just to teach them the gospel but to apply the gospel to their tensions and conflicts and bring them together in unity. That’s what we’re going to see next week in Romans 14. Paul is going to bring together everything he’s been teaching on the gospel and get it working on bringing unity to a church that was heavily tempted to be divided. And he does it by teaching them the gospel. He feels like it’s his obligation before God. Look at verse 14. That was our first Hide the Word verse from the book of Romans. And with good reason. In many ways, that’s the thesis statement of this entire letter. Paul is not ashamed of the gospel, and neither should we be. There is no good reason but there are plenty of bad ones. It’s easy to approve of the gospel here in this room where we all agree, but it’s much harder out there where people are hostile to it. Many people are hostile to the gospel today. And people were hostile to it in Paul’s day, too. But that didn’t matter to Paul. He was not going to be ashamed of the gospel of Jesus Christ. Why? Because the gospel had power in it. The power of salvation. To ALL, everyone, who believes. First for the Jew and then also for the Gentile. Notice that. Both Jew and Gentile again. That’s important in Romans, isn’t it? Paul is not ashamed of the gospel because that’s where the power is. Be afraid of getting your power from anywhere else than the gospel. And it’s the power of salvation. #2. I AM DESPERATELY IN NEED OF SALVATION. Here’s how we said it when we studied this the first time. To understand the good news you first have to understand...what? The bad news. We have a righteousness problem. 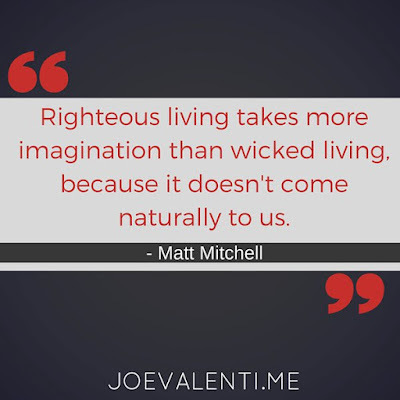 The problem is that we are not righteous. We need righteousness but we don’t have it on our own. And because of that, we are desperately in need of salvation. We push down the knowledge of God because we don’t want to be accountable to Him. But deep down we know that we are. And we are without excuse. The rest of chapter 1 tells us the bad news. Humanity is wicked, and we deserve condemnation. We have “exchanged the truth of God for a lie, and worshiped and served created things rather than the Creator!” (V.25). Humans have become “filled with every kind of wickedness, evil, greed and depravity. [We] are full of envy, murder, strife, deceit and malice. [We] are gossips, slanderers, God-haters, insolent, arrogant and boastful; [we] invent ways of doing evil; [we] disobey their parents; [we] are senseless, faithless, heartless, ruthless. Although [we] know God's righteous decree that those who do such things deserve death, [we] not only continue to do these very things but also approve of those who practice them” (29-32). We are desperately in need of salvation. That’s the bad news. And then we learned the even worse news. And that’s that we can’t wiggle out of problem. Chapter 2 shows the Jews who might have thought that they had a leg up on the non-Jews when it came to salvation that they were in just as bad a predicament as the Gentiles. And that’s true of us who might think that being “pretty good” is enough. It’s not enough. And following the law is not good enough. We are all in the same boat. We are all desperately in need of salvation. That should keep us humble. Shouldn’t it? It’s so easy to pass judgment on other people. I think that’s what I hate the most about social media these days. It’s so easy to broadcast our judgment of other people and heap shame on them for not being as good and wise and smart and wonderful as we are. But we are, on our own, desperately in need of salvation. “There is no one righteous, not even one...” (3:10). That’s the bad news and the even worse news, but the worst news of all is that there is nothing we can do about it. We cannot solve our own righteousness problem. But that’s where the good news comes in, doesn’t it? That’s where the gospel really gets rolling. Because God has solved our righteous problem for us. Or as Paul said in chapter 1, verse 17. #3. I AM JUSTIFIED BY FAITH ALONE. He has solved our dikaiosunai problem. And He’s even solved His own righteousness problem. Not that He is unrighteous but He would be if He kept on forgiving sinners without bringing justice. Here’s how he did it. Look at chapter 3, verses 21 through 26. Maybe the most important paragraph in the letter. The rest of the world thinks that we get saved by being good and doing good and doing more good than we did bad. But the gospel of grace says that we are saved by trusting alone in Jesus and what Jesus did for us on the Cross. Or as Paul says in chapter 3, verse 28. Have you trusted in Jesus Christ and His work on the Cross for you? That’s how you get justified. That’s how you get the righteousness you need to be saved. Or as we memorized in chapter 6, verse 23. And only in Him. In trusting Him. I am justified by faith alone. A lot of people find that hard to believe. Paul ran into a lot of people who found that hard to believe. Including a lot of Jews. We are justified by faith in Jesus alone. If you have not yet trusted in Jesus Christ as your Lord and Savior and Justifier, then I invite you to do so right now. Romans 10 says, “That if you confess with your mouth, ‘Jesus is Lord,’ and believe in your heart that God raised him from the dead, you will be saved. For it is with your heart that you believe and are justified, and it is with your mouth that you confess and are saved. As the Scripture says, ‘Anyone who trusts in him will never be put to shame.’” (10:9-11). I am justified by faith alone in Christ alone. And that makes all of the difference both now and forever. #4. I AM BLESSED BEYOND MEASURE IN JESUS CHRIST. In chapter 5, Paul starts to list the blessings of justification. If we are justified then we have everything imaginable and beyond imagine going for us. Listen to first few verses of chapter 5. And he just picks up steam from there. Peace, access, grace, hope, glory, joy, love, salvation from wrath, reconciliation, and so much more! Paul compares the awful things that we deserved in Adam and the blessings we get from being in Christ. And it just gets better and better. Grace abounding. Grace increasing. In fact, it almost seems to good to be true. I think, in some ways, that’s why Paul wrote chapters 6 through 11. In those chapters he answers the objections that people raise to his gospel of grace. What’s Paul’s answer to that? That’s crazy talk. Are you seriously asking that? Paul answers every objection and every question. No, believing this gospel does not lead to more sin. Because when you believe this gospel everything changes for you. You become a new person. And you get a new master. You enter into a life-changing relationship with Jesus Christ. Sin is no longer your master and neither is the Law of Moses. Do you remember this stuff? Chapters 6 and 7? We don’t have time to go over it all again today. We’re going to this table right here. But Paul answers every objection and shows how we now have new relationship with sin and death and the Law. We have died to them. Yes, we still sin. And in fact, we struggle with sin greatly so much that we often despair. But that’s a good thing. It means that we hate our sin and we love our Savior. And He will see us through. He will rescue us from this body of death. We are blessed beyond measure in Jesus Christ. And it doesn’t any more glorious than what we find in the “Great Eight.” Romans 8. Why? Because we have the son. And because we have the Spirit! Chapter eight is all about life in the Spirit. He lives in us now that we believe and that makes all of the difference. We live now according to the Spirit. He testifies with our spirit that are God’s children. He helps us in our weakness. He helps us to pray. I am blessed beyond measure because of the Holy Spirit! Who will bring any charge against those whom God has chosen? It is God who justifies. Who is he that condemns? Christ Jesus, who died–more than that, who was raised to life– is at the right hand of God and is also interceding for us. There is one objection to his gospel that actually worries Paul. You and I don’t tend to think about it, but it was on Paul’s mind. Remember how he went from soaring joy in the great chapter 8 to his “sorrow and unceasing anguish” in chapter 9? God had made so many great promises to Israel, but look around. So few Israeli Christians. And Paul takes 3 chapters to show that it is true. He has kept His promises to Israel. He is keeping His promises to Israel. And He will keep His promises to Israel. He hasn’t done it like we might have expected. He actually is using the Gentiles to save the Jews. God does things in His own mysterious ways. Chapter 11, verse 33. Which leads to our last point for today before we go to the table. #5. I AM BEING TRANSFORMED BY THE GOSPEL. In chapter 12, Paul looks back over 11 sweeping chapters of God’s grace and mercy in the gospel and calls us to apply the gospel to our whole lives. Remember our last memory verse in Romans? Give your whole self to God and allow God to change your whole self through His truth. We had four messages on chapter 12 and how God wants a transformed people. Transforming how we think about ourselves. Transforming how we relate to each other. Transforming how we use our gifts to serve the body of Christ. Listen to chapter 12 verses 9 through 21. “Love must be sincere. Hate what is evil; cling to what is good. Be devoted to one another in brotherly love. Honor one another above yourselves. Never be lacking in zeal, but keep your spiritual fervor, serving the Lord. Be joyful in hope, patient in affliction, faithful in prayer. Share with God's people who are in need. Practice hospitality. Bless those who persecute you; bless and do not curse. Rejoice with those who rejoice; mourn with those who mourn. Live in harmony with one another. Do not be proud, but be willing to associate with people of low position. Do not be conceited. Do not repay anyone evil for evil. Be careful to do what is right in the eyes of everybody. If it is possible, as far as it depends on you, live at peace with everyone. Do not take revenge, my friends, but leave room for God's wrath, for it is written: ‘It is mine to avenge; I will repay,’ says the Lord. It’s impossible to live that way. Unless we have the transforming power of God’s grace at work in our life. The same thing is true of chapter 13. It’s almost impossible to submit to the governing authorities in the way that Paul says that we should unless God’s grace is transforming us. Have you given yourself wholly to God in the way verse 1 says to? Have you climbed up on that altar and presented your life to the Lord in view of His amazing grace? And are you allowing yourself to become a new person by His grace? Do you look more and more like verses 9 through 21? The gospel is the power of God to save us and to change us. To change us into the image of Jesus. Chapter 13 ends this way. It ends with a call to know what time it is. May this be true of all of us. May we be transformed by the gospel of grace in Jesus Christ our Lord.